I think I may cook a bit like I dress. I find a beautiful basic that I really love (like this skillet salmon) and simply accessorize differently (change up the flavor profile) to create a whole new look (entrée). I did this quite often when we were eating a good deal of chicken... not unlike a lot of other folks. I think anyone that eats a lot of chicken can relate to the 101 different chicken dishes they can produce at the drop of a hat. With chicken on the ebb... and vegetarian or pescatarian fare more the norm, I've found myself simply changing up how plates get "accessorized" without really having to veer too far from the basics I love. 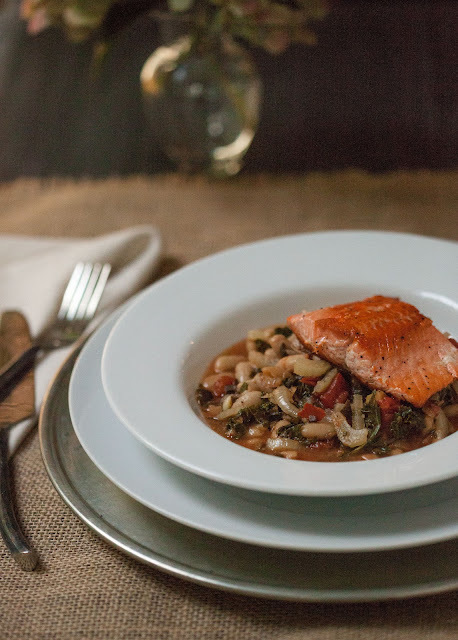 It not only simplifies weeknight dinners... but makes for a pretty simple dish that's fitting for company as well. 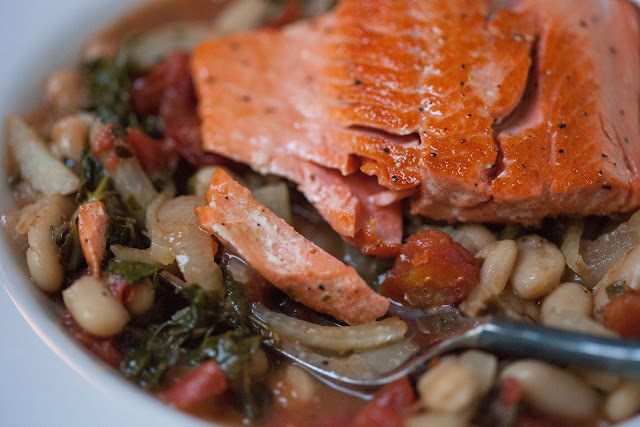 The warm, rich flavors of this simple sauté perfectly complement this quick skillet salmon. Sliced fennel and onion are mellowed and sweetened for a bit before adding chopped kale to the mix (I know... more kale!). Not only does the kale offer a great color complement, it's a great way to incorporate healthy greens. 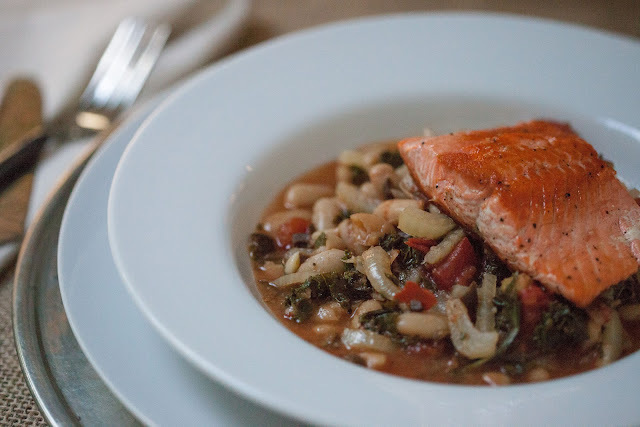 Once wilted down, tomatoes, capers, black olives, flat leaf parsley... and a dash of fresh lemon juice... give this base a great, fresh, and slightly tart flavor that balances the more subtle, pan-seared notes of the salmon. Heat olive oil in a large skillet over medium heat. Add fennel and onion to skillet and sauté for 4 to 6 minutes, until translucent. Add kale to skillet; cook until wilted, about 2 minutes. Season mixture with a scant bit of salt and pepper, to taste. Add in tomatoes, beans, broth, capers, and olives. Reduce heat to medium low and simmer for approximately 10 minutes. Add parsley and lemon juice, stir to combine. Season with additional salt and pepper, to taste. Remove from heat, cover and set aside to keep warm. Meanwhile, heat canola oil in another large skillet over medium high heat. Season salmon fillets with salt and pepper and place in skillet skin-side down. Cook salmon for approximately 2 to 4 minutes (I look for it to be cooked about 1/3 to 1/2 way up the side before turning). Turn salmon. With tongs (and fork, if needed), carefully remove the crisped skin and discard. Cook salmon for another 1 to 2 minutes, then flip to just sear side you removed skin from. Remove to cutting board or place in/on foil to sit for 1-2 minutes. Watch carefully to avoid overcooking... salmon should break away gently with fork. Ladle a large spoonful or two of bean mixture into a bowl and top with salmon. Serve immediately. note: you may have some of the bean mixture left over... which can be enjoyed on its own.